For some employees, verbal abuse can be the everyday language of doing business. Defending yourself from these verbal abusers—calmly, professionally, and successfully—can be crucial to your on-the-job success. Nationally recognized linguistics expert and author Suzette Haden Elgin applies her acclaimed techniques for combating verbal attacks to common workplace situations. Powerful yet unthreatening, her proven strategies will help you recognize and defend yourself from verbal abuse—everything from casual obscenities and racist or sexist language to sarcasm, cutting jokes, and subtle put-downs. Richly illustrated with fully dramatizes scenarios and real-world examples, Dr. Elgin’s communication techniques will help you instantly take control of any verbal confrontation. You’ll also learn how to avoid “malpractice of the mouth” and sexual harassment; communicate sensitively and clearly with non-native English speakers; and project a strong, straightforward, and trustworthy image. You’ll find tips for handling sensitive issues via email and voice mail, advice on meeting the communication challenges that face home-based and virtual businesses, and plenty of “workouts” placed throughout the book to give you valuable opportunities to practice your new skills. 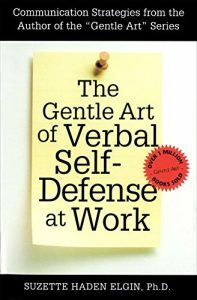 The Gentle Art of Verbal Self-Defense at Work is your roadmap through the potentially career-threatening minefields of workplace communication.